The very dry rainy season continues and is the major topic of conversation among anyone who has any connection to la tierra (the land). 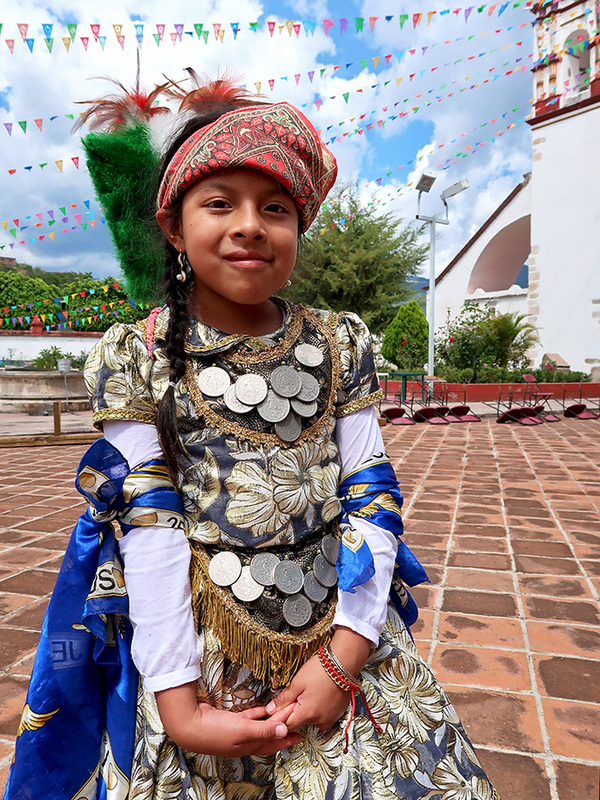 However, during today’s Fiesta a la Natividad de la Virgen María in Teotitlán del Valle, the Zapotec god Cosijo answered the prayers for rain. 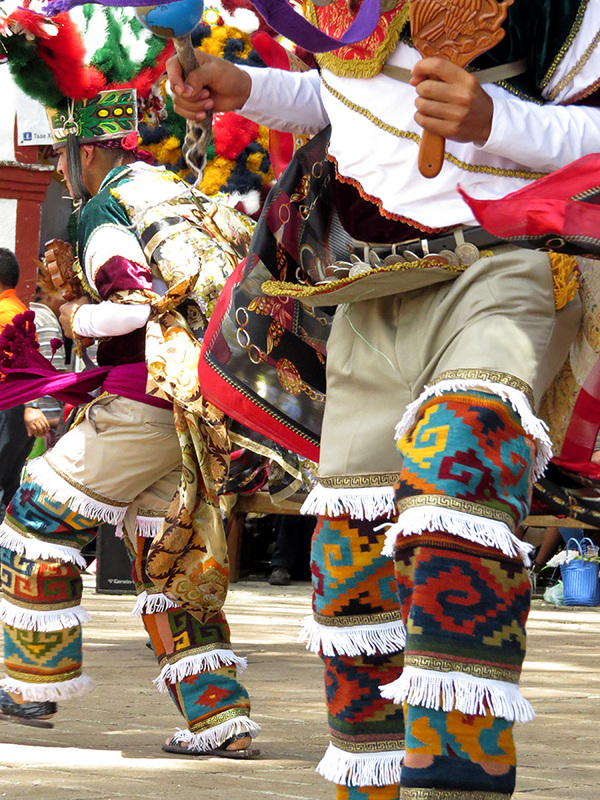 Moctezuma (Sergio Gutiérrez Bautista) danced the story of the Conquest. Doña Marina (Elizabeth Hernández Gutiérrez) danced her part. The rain began to seriously fall and the plastic penacho (headdress) covers came out in force, but the danzantes continued to dance. Comida (lunch break) came just in time, the sun came out, and Malinche (Quetzali del Rayo Santiago Ruiz) graciously posed for photos. 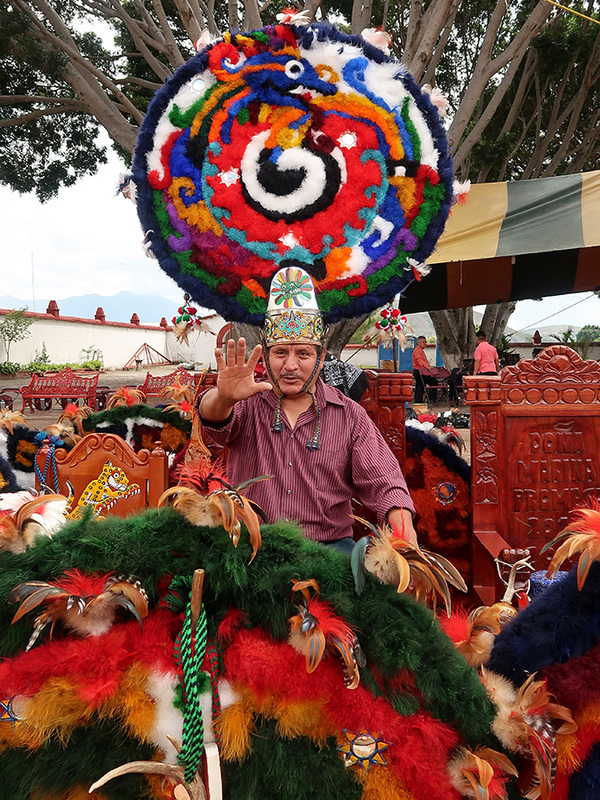 And, Javier Gutiérrez Hernandez (dance master, choreographer, former danzante, and father of Moctezuma) posed with his son’s penacho. A little means a lot, though probably not enough to salvage this season’s milpa (field of corn, beans, and squash). But, when your culture dates back at least 2,500 years, you take a long view of history. Yippee!!! 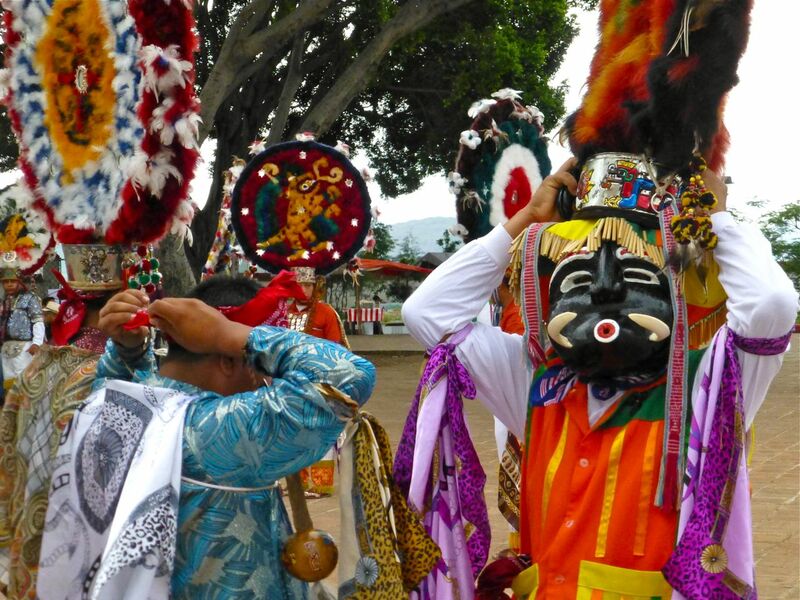 After an “exhaustive” (see news report) selection process that took the Comité de Autenticidad (Committee of Authenticity) to 89 communities throughout the state of Oaxaca, they announced the delegations that will be participating in this year’s Guelaguetza. 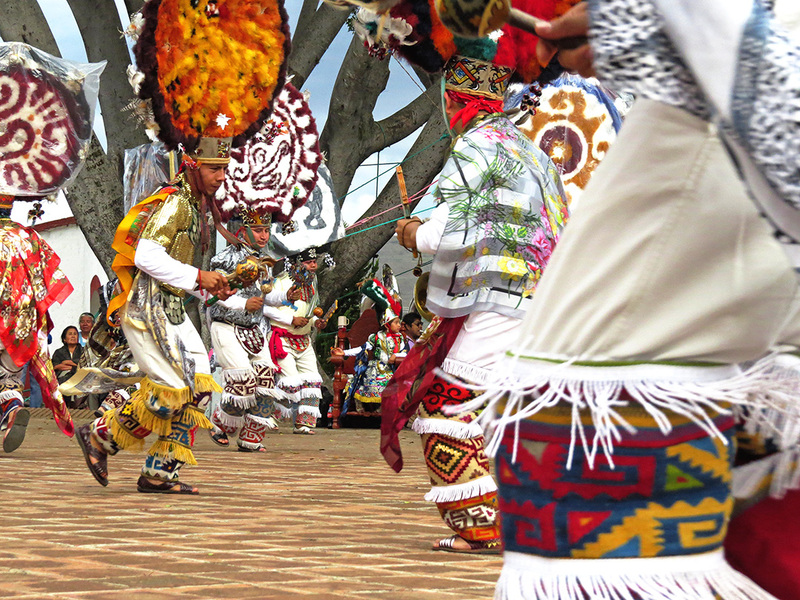 And, drum roll please, one of the 56 delegations chosen will be Teotitlán del Valle’s Danza de La Pluma Promesa 2016-2018! I’m so happy for the entire group, many whom I’ve come to know, but especially for Edgar Daniel Ruiz Ruiz (above in red shirt), one of the two dancers blogger buddy Chris and I are sponsoring. 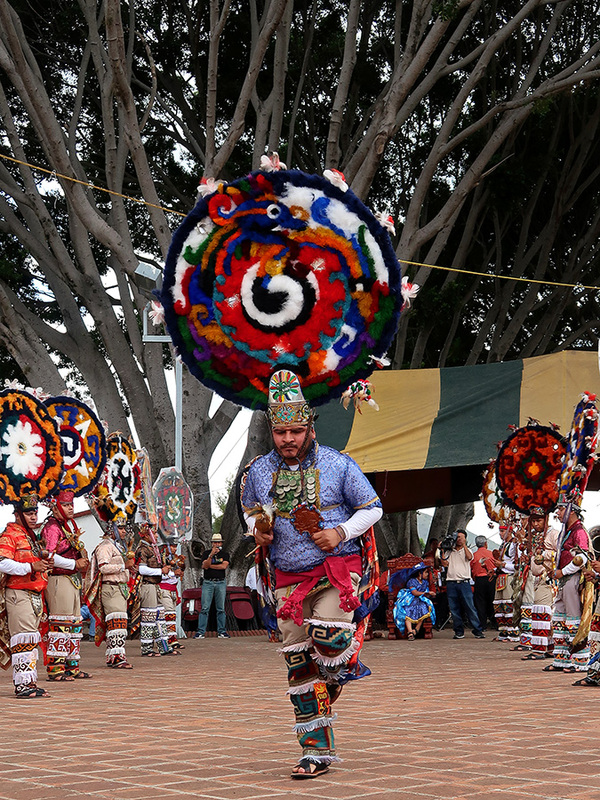 He missed out when the group performed at the Guelaguetza two years ago, as he was recovering from surgery and this is his last opportunity — their three-year “act of devotion” to dance for their community ends this year. The group will be performing at La Guelaguetza on the morning of July 23. 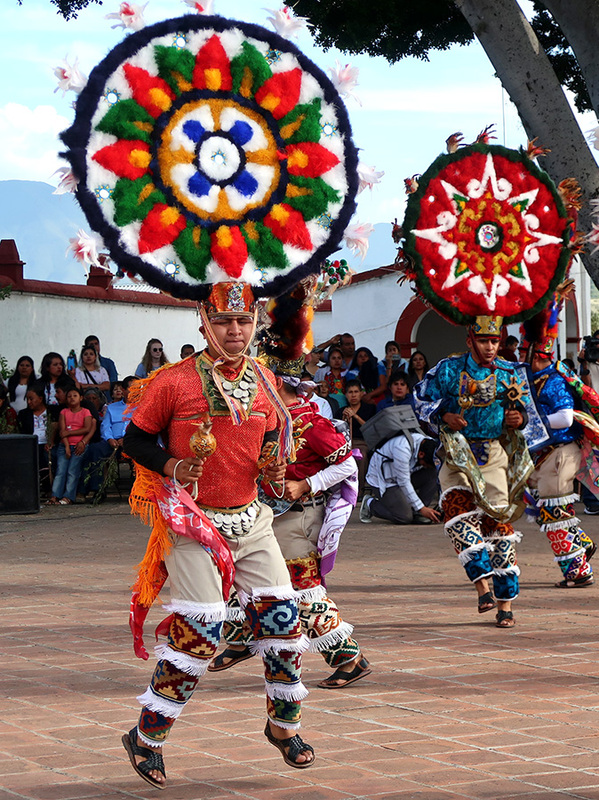 If you can’t be up on Cerro del Fortín, it is usually broadcast live on local TV and streamed on the internet. I’ll keep you posted! 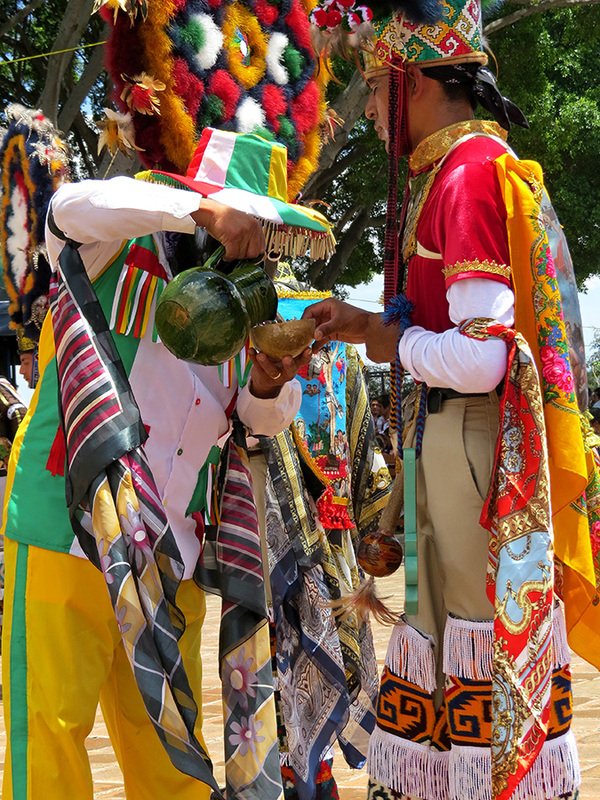 The above photos of the Danza de la Pluma Promesa 2016-2018 are from the previously mentioned and recently concluded festival honoring La Preciosa Sangre de Nuestro Señor Jesucristo — the most important annual festival in Teotitlán del Valle. Thanks Teotitlán, I needed that! 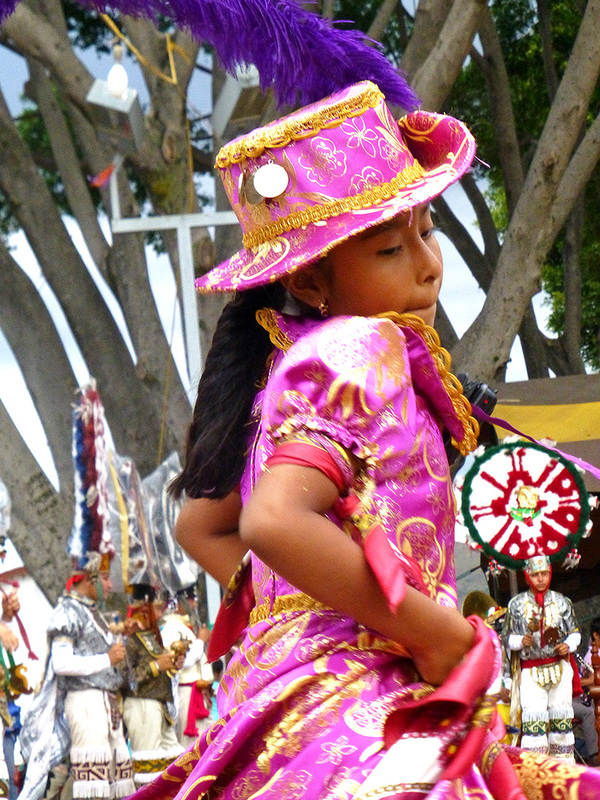 Yesterday, after missing the Fiesta de la Natividad because I was in the middle of my 6-week cross-country sojourn in el norte, I managed (courtesy of blogger buddy Chris and his trusty VW Jetta) to make it out to Teotitlán del Valle for the last day of the Fiesta de La Virgen del Rosario and performance of the Danza de la Pluma. 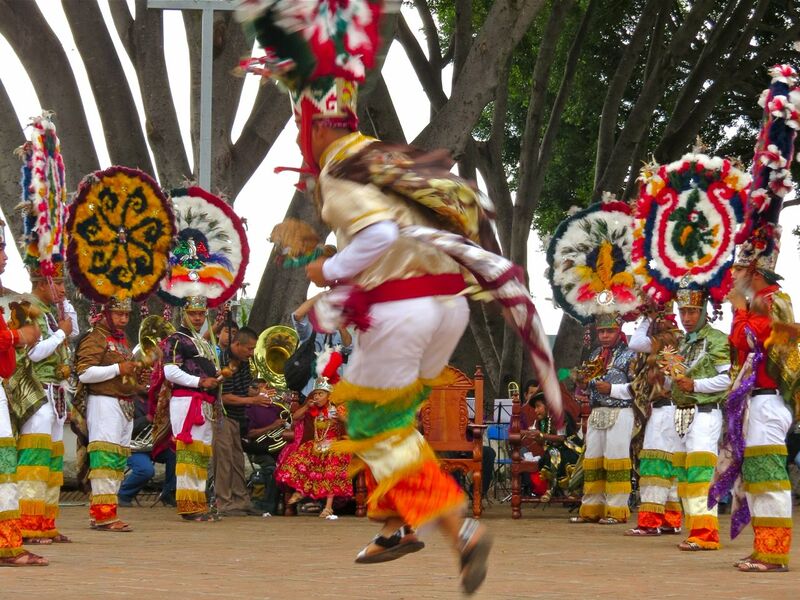 The dance is day-long and recreates the Spanish Conquest from the Zapotec point of view. Miracle of miracles, the rain held off, the clouds parted, and the sun made a much welcome appearance. As we approached the atrium of the Templo Preciosa Sangre de Cristo, the father of one of the Danzantes explained a venue change — due to some (hopefully) minimal earthquake damage to one of the bell towers of the church, the Danza de la Pluma was moved next door to the plaza in front of the municipal building. A heartfelt muchisimas gracias to the people of Teotitlán del Valle, many of whom I am so lucky and grateful to call friends. The warm welcome I received was such an incredible tonic to the grey days we have been experiencing in Oaxaca. 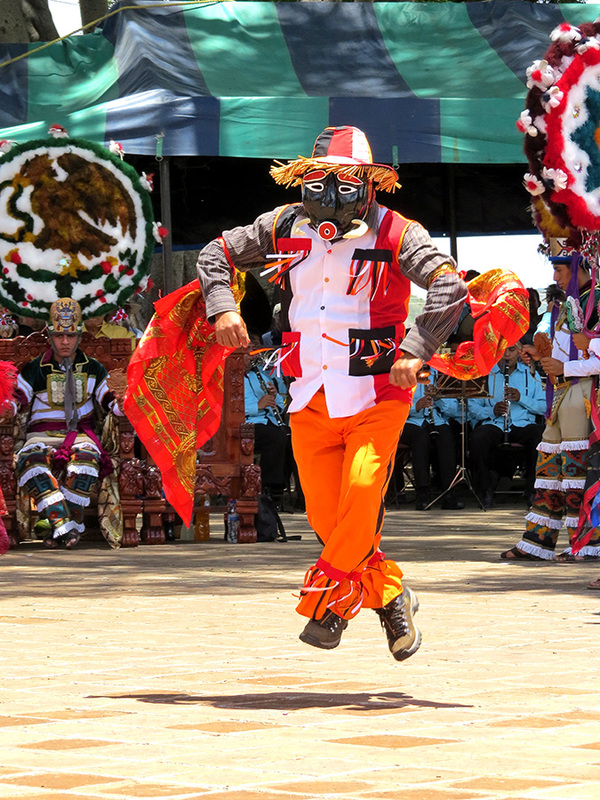 One of the much anticipated features of this year’s Fiesta Titlular a la Preciosa Sangre de Nuestro Señor Jesucristo in Teotitlán del Valle was the debut of the new Grupo de Danza de Pluma Promesa. 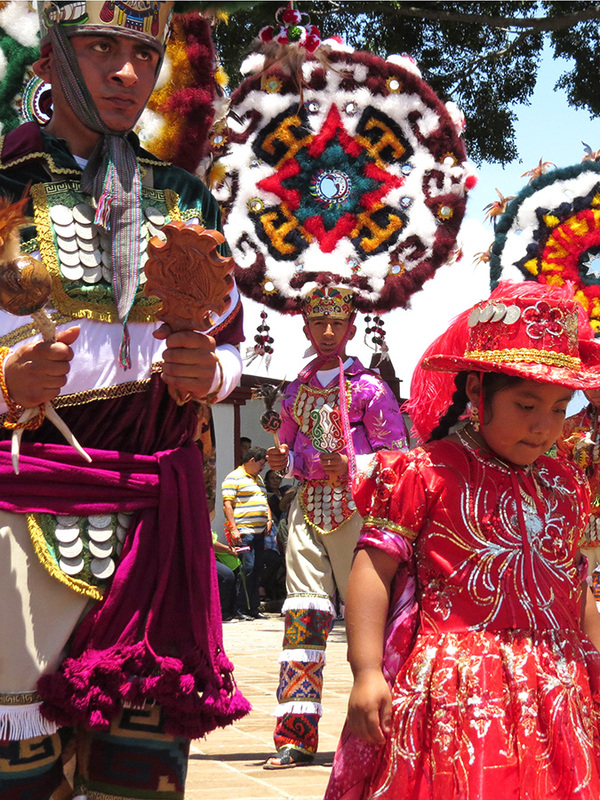 Unlike in many of the other villages, where the Danza de la Pluma is danced by folkloric dance troupes, in Teotitlán del Valle nineteen young men and two little girls make a promise to their god and, thus, their community to learn and perform the dance at each of the four annual major religious festivals in the village for three years. 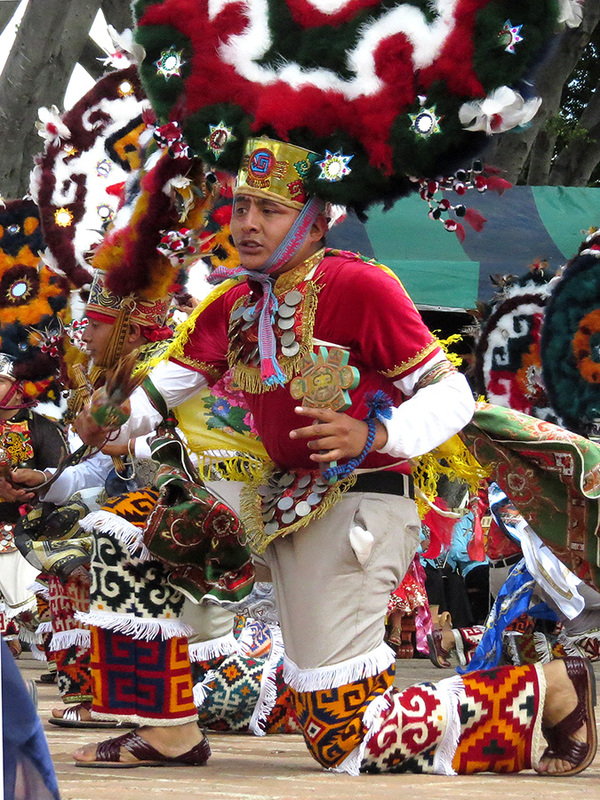 This is not a commitment to be taken lightly, as there are 40+ dances that comprise this Zapotec retelling of the story of Moctezuma and the Aztecs battle with Cortes and the Conquistadors. The entire telling of the story takes almost eight hours to perform in the church plaza — in conditions that can vary from brilliant sun with sweltering temperatures to gusty winds to drizzling rain. It’s been almost six months since we first saw the new group at one of their early practice sessions. In jeans, t-shirts, and gym shoes, the guys were at the beginning stages of learning the steps. They have learned well and it’s going to be an outstanding three years! 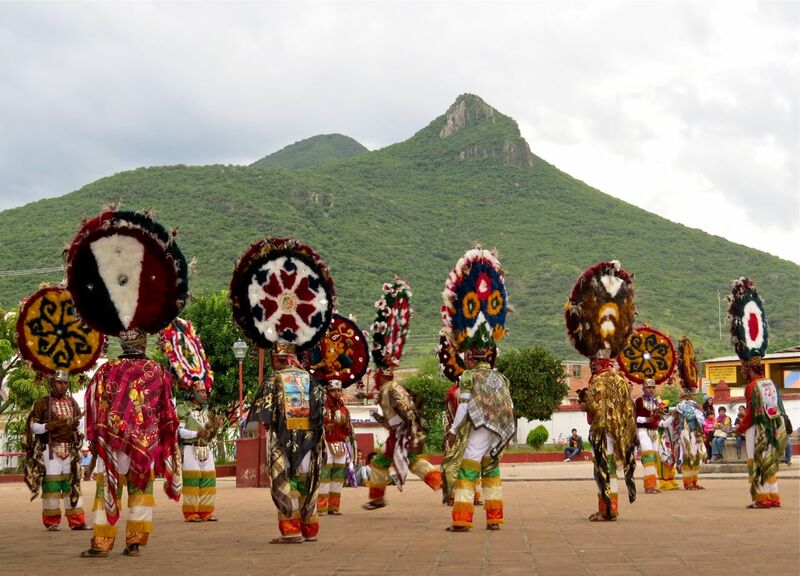 After being rained out on Sunday, we picked ourselves and our rain gear up and returned to Teotitlán del Valle on Monday for the abbreviated version (4 hours instead of 8 hours) of the Danza de la Pluma — more of the multi-day fiesta honoring La Santísima Virgen María de la Natividad (the Sainted Virgin Mary of the Nativity). 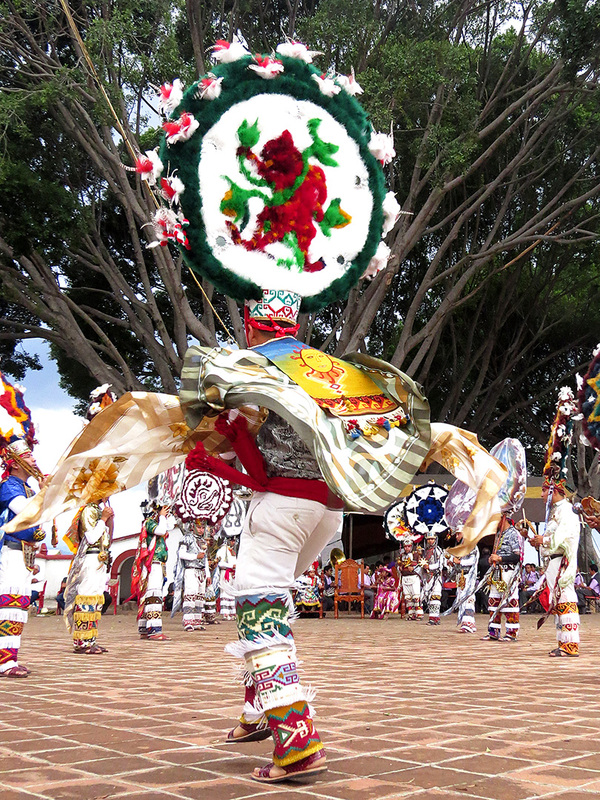 As I’ve previously mentioned, the Danza de la Pluma is a ritual re-enactment of the Spanish conquest. 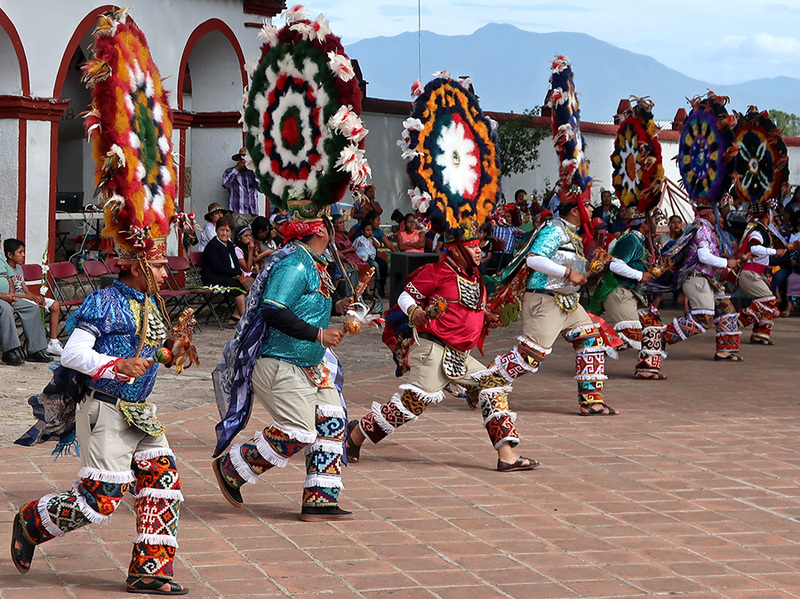 The full version is told in 41 bailes (dances) and lasts from early afternoon into the night. 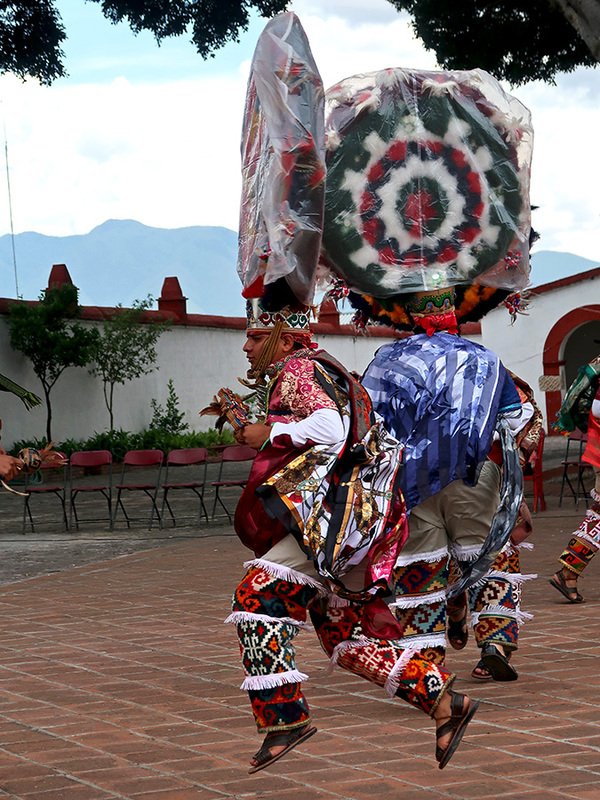 It is danced by folkloric groups throughout the valley of Oaxaca. 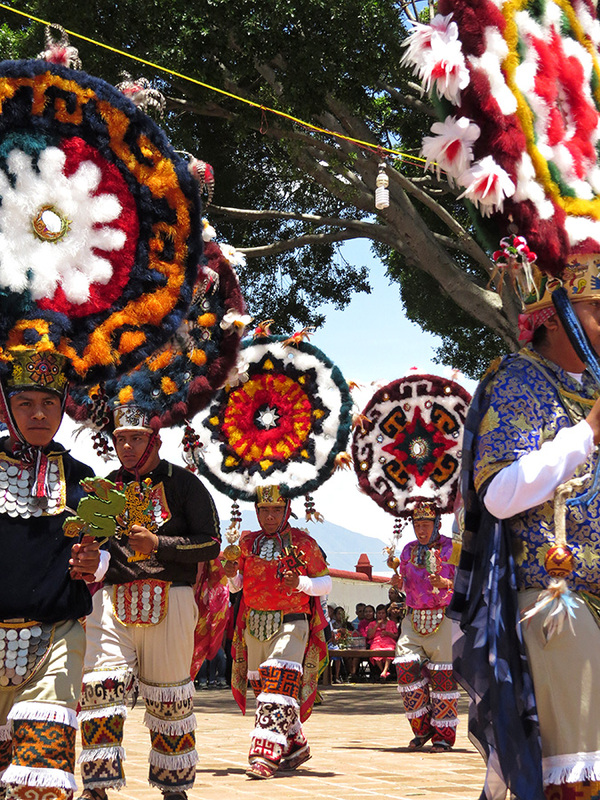 However, in Teotitlán, Moctezuma, Danzantes, Subalternos, Malinche, and Doña Marina are selected years in advance and make a promise to the church and community to perform their roles for 3 years. It is a great honor. La Malinche (Juana Lizbeth Contreras Vicente), Doña Marina (Ailani Ruíz Ruíz), and Danzantes. 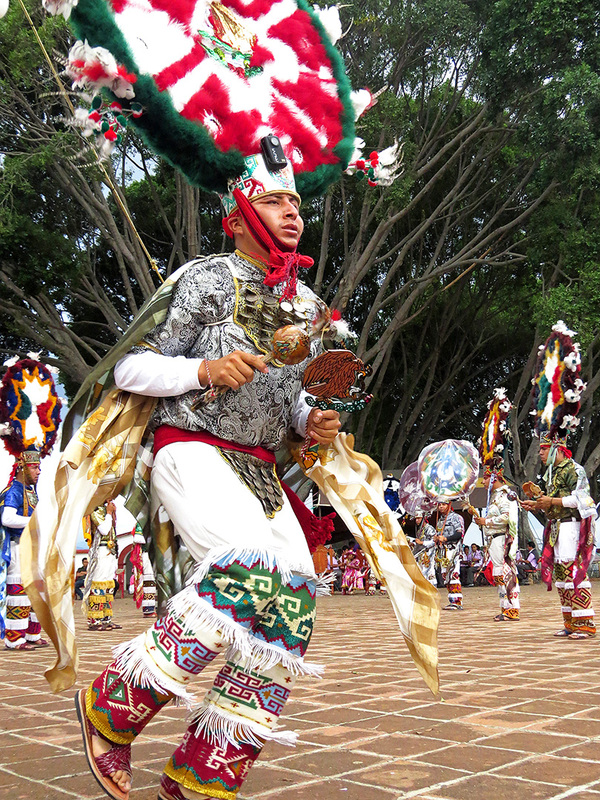 Moctezuma (José Isaac Vasquez de Los Angeles) poised to dance the dance. 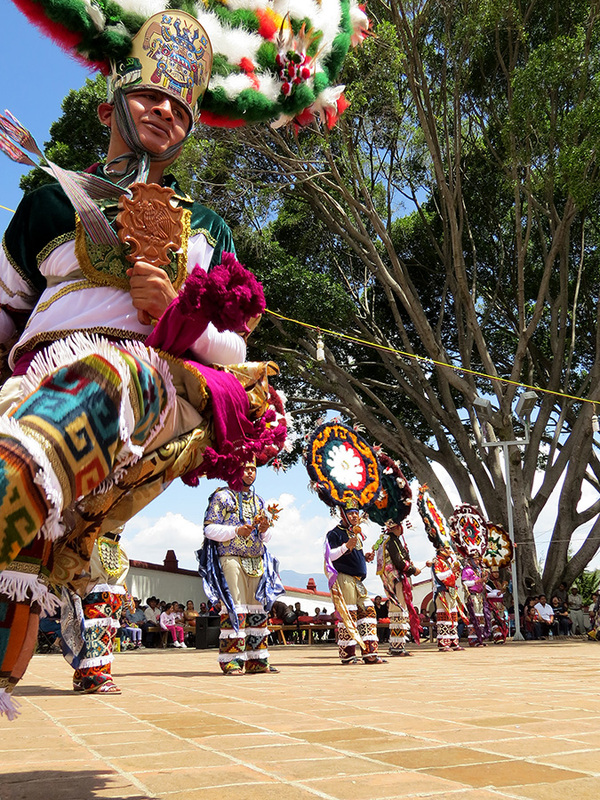 Moctezuma approaching… dancing the dance. 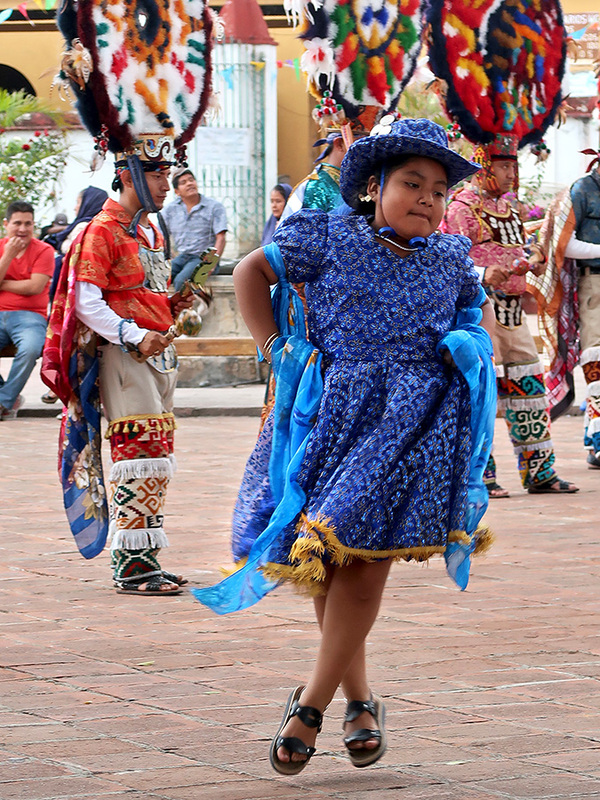 Moctezuma departing… dancing the dance. Doña Marina dancing the dance. The Danzantes dancing the dance. The rains came again and we missed the fireworks and castillo. 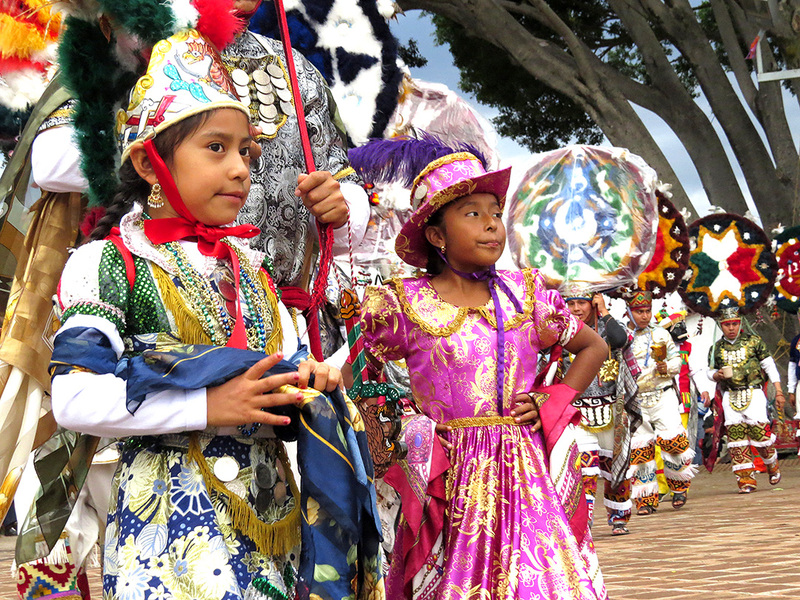 However, we are already plotting our return at the beginning of October for the Rosario de la Virgen María festival. 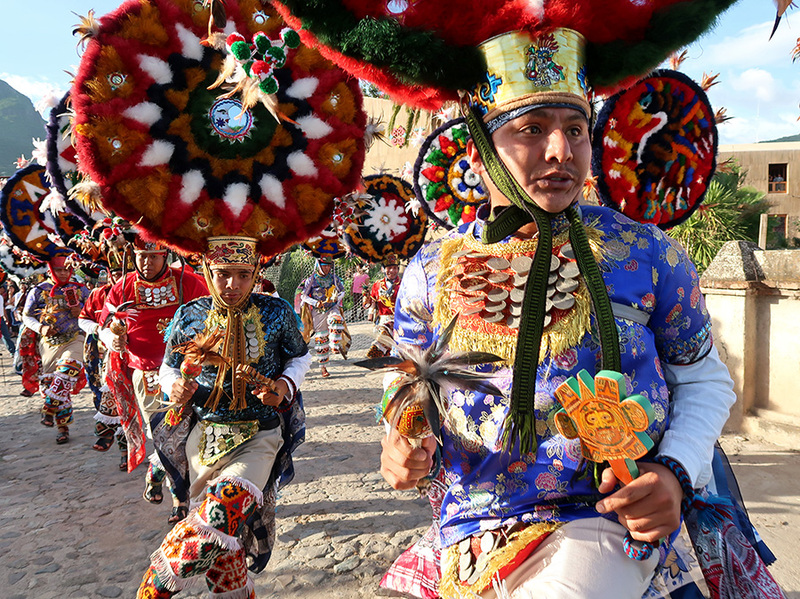 We returned to Teotitlán del Valle on Tuesday and Wednesday the Danza de la Pluma — more of the multi-day fiesta honoring Preciosa Sangre de Nuestro Señor Jesucristo. 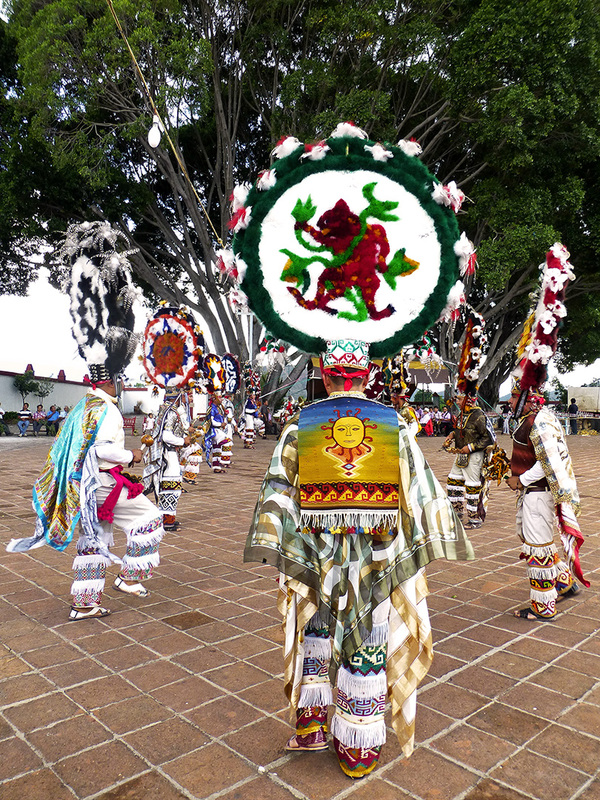 The Danza de la Pluma is a ritual re-enactment of the Spanish conquest. 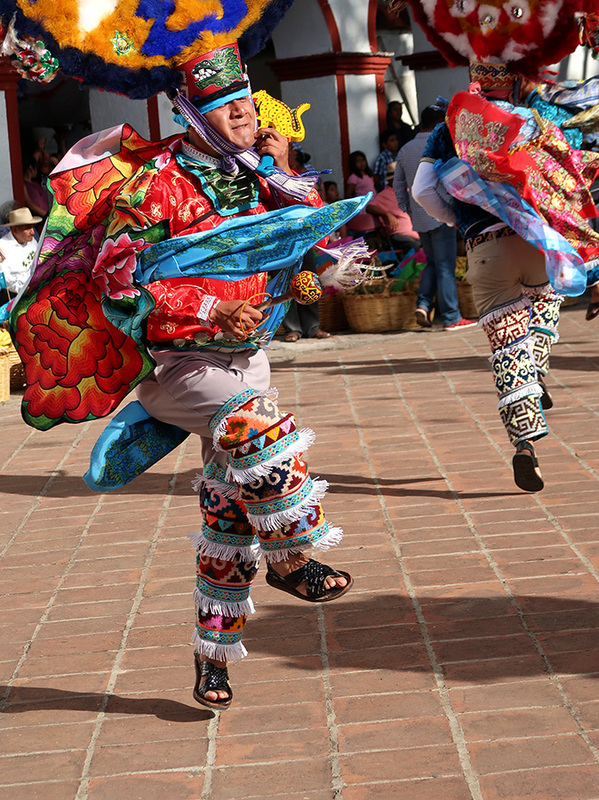 The story is told in 41 bailes (dances) and lasts from early afternoon into the night. 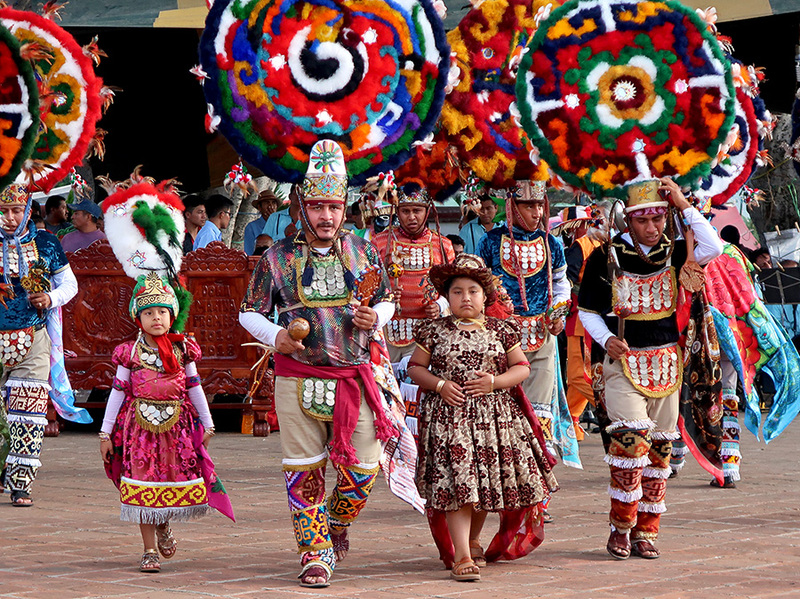 It is an honor to be a participant — the Danzantes, Moctezuma, the Subalternos, Malinche, and Doña Marina are selected years in advance and make a promise to the church and community to perform their roles for 3 years. All is not completely serious — the Subalternos provide a little levity along the way. The subtext and “hidden” narratives of the danza are multiple and complex and after 5 years, I’m only in the infant stages of understanding. I will leave it to the two scholarly articles listed below to attempt interpretation. Cohen, Jeffrey. 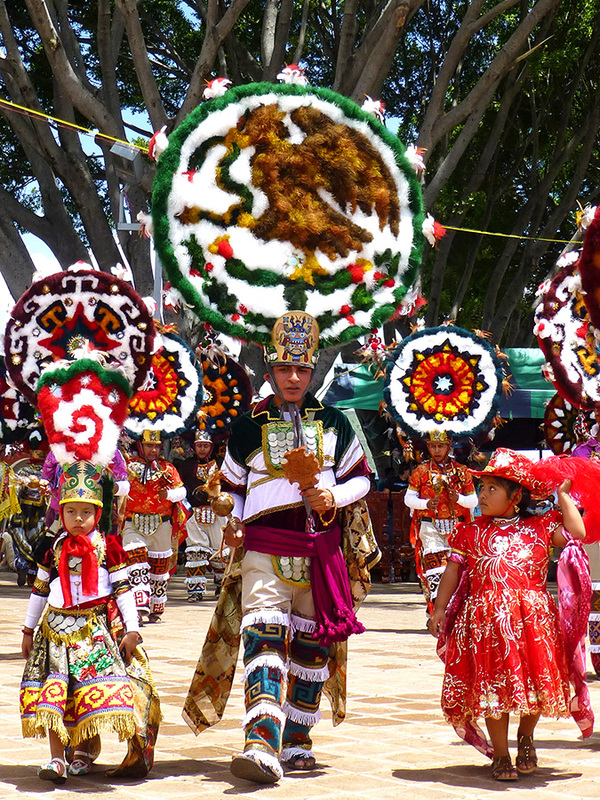 Danza de la Pluma: Symbols of submission and separation in a Mexican Fiesta. Anthropological Quarterly, Jul 93, Vol. 66 Issue 3, p. 149-158. Harris, Max. The Return of Moctezuma. The Drama Review, Sp 97, Vol. 41 Issue 1, p. 106, 29 p.
The origin of this dance goes back to the spiritual and physical conquest of Mexico by the Spanish – La Guerra de Conquista. 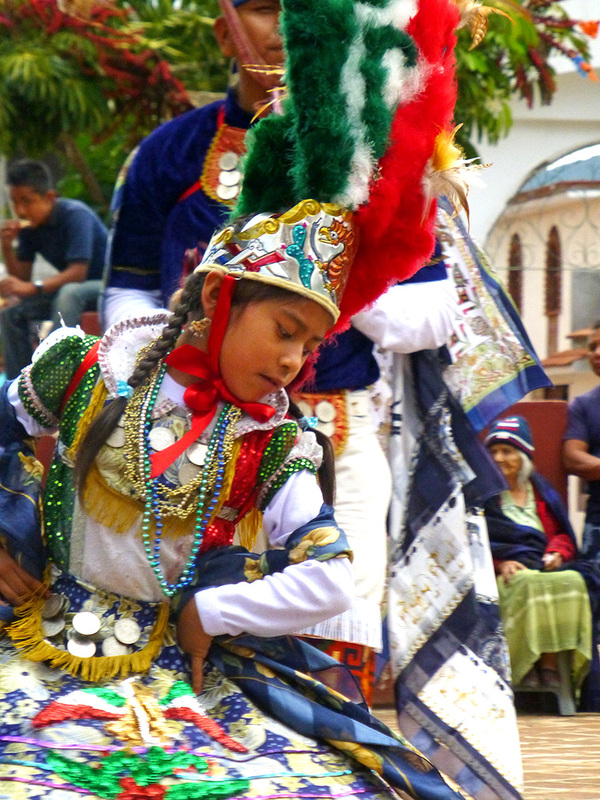 The dance originated in the town of Cuilpam de Guerrero where Martin Cortes (son of Cortes) celebrated the first baptism of his child. Martin played the role of his father and the locals played the roles of the conquered indigenous peoples. 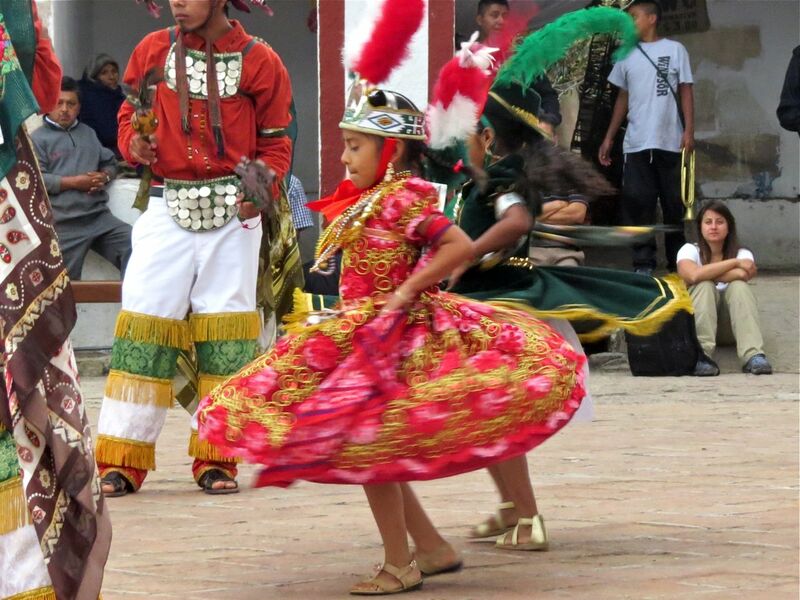 The story is told in 41 bailes (dances) and lasts from early afternoon into the night. Selected years in advance, it is an honor to be a dancer and they perform their roles for 3 years. This week, during the multi-day fiesta honoring Preciosa Sangre de Nuestro Señor Jesucristo, we saw the first performances by the new cast and they looked great!